Whether you're a home PC user or a professional using it at your workplace, sooner or later you're going to face hardware issues related to the computer. Things become more depressing when the PC is out of the warranty period. Fortunately, changing a faulty component or adding a new peripheral device is not that hard, provided you have the right tools for the same. That's where repair toolkits come to the rescue. Although we all have few basic tools for handling electricity related issues at home or office, they're just not fit for PC repairs. That's why I've compiled a list of some of the best repair toolkits aimed at PC users. Every toolkit is unique and is quite popular among its user base. Even if you've never repaired your PC before, watching the video tutorials combined with a powerful toolkit can help you fix the issues in no time. Some of the utensils included in these toolkits can also be used to repair a Mac system. Let's check out these handpicked and useful PC repair toolkits to keep our old computers in good health for years. If you're purchasing the toolkit for the very first time, I'll recommend going for the one having a larger toolset. It'll ensure you don't have to go for a second one, in the future. Pro Tip: While going for a repair toolkit, do not hesitate in grabbing a blower as well. 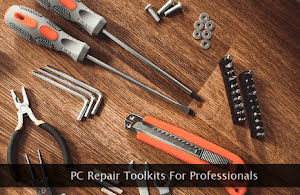 And now, let's get started and browse the list of PC repair toolkits. Feel free to compare the shortlisted ones—before making a final decision. This all-in-one repair toolkit deserves a mention in this list. It's one of the most popular toolkits on Amazon with loads of positive reviews from real users. It has a total of 60 different tools—out of which 56 are bits—which can be used with almost any modern electronic device, including a PC too. The bits are made of chrome-vanadium steel which makes them quite sturdy and long lasting. Its flexible shaft is ideal for dissembling difficult-to-reach parts—in no time. The entire kit itself is compact and portable facilitating easy carriage to long distances. And, last but not the least, the price is just right bringing it to the reach of the masses. This is yet another good PC repair toolkit to keep your computer in good health and to keep it free of any hardware issues. It has a total of 80 different tools—out of which 56 are screwdriver bits—to quickly dissemble almost any device. The screwdriver's shaft extensions are completely flexible to work easily with difficulty-accessible parts. Its 3 ESD-coated tweezers are perfect for picking minute parts and for handling thin wires. It also has a connector for an electric screwdriver. This enables you to use the required bits for other purposes—like electricity issues—too. Its anti-slip driver handle is just perfect for both light as well as rigorous jobs. The number of tools included in this price range—is the best deal. This high-end repair toolkit is aimed towards serious professionals. It's good both for PC and Apple products. Though it's a bit pricey, the quality and finish—justify it—completely. Up to 64 bits are included in this toolkit and each one of them is carefully crafted to fit a vast array of modern devices. This toolkit comes with several step-by-step repair guides. It also has a support forum, where a large community of helpful users can assist you in your repairing endeavors. This repair toolkit comes with a lifetime warranty which itself asserts its quality. Its bits' set can also be used to dissemble legacy electronic devices. I'll recommend it—if you're a professional and prefer quality over the price for the very best repairing experience. If you're tight on budget, go for this excellent repair toolkit. It has a total of 43 tools, out of which—36 are screwdriver bits—for repairing electronic gadgets and devices. Its ergonomically-designed and slip-proof driver handle enables you to complete all the delicate repairing jobs—with ease. The extension bar helps in reaching difficult parts of the electronic device. It has a generous 90-day money back guarantee. It's one of the most compact and light-weighted repair toolkits one can easily carry—without any burden. All the bits included in this toolkit are magnetic and facilitates easy removal and picking of small parts and nuts. It's a perfect repair toolkit, one can give—as a gift. This list will be incomplete if this repairing toolkit is not mentioned. It has a total of 60 different tools, out of which—56 are screwdriver bits—equipping you with an ultimate dissembling solution. The screwdriver's anti-skidding big handle gives you a good and comfortable grip to open delicate parts—quite easily. Its durable and flexible shaft looks good because of its spring cover. The carry case of this repairing toolkit is stylish and has a comfortable hand grip support. A lot of reviews of this toolkit clearly mention that they didn't expect the good quality they got—at this price. It also has an extension rod to make sure the screwdriver can reach to the most congested part of the device. This toolkit is also perfect for smartphone repairs. And, last but not the least is this universal repair toolkit that comes at an attractive price. The tools included in this kit are shatter-resistant and last for long. It has one of the nicest and sturdiest carry cases which makes it an ideal choice for frequent travelers. The screwdriver handle is rotatable making it quite easy to work with. The labeling within the storage case enables one to arrange the tools in the correct order—after the usage. This repair toolkit comes with a 12-months warranty. The magnetic tip of its screwdriver enables quick removal of screws from the deep holes. All the tweezers are ESD-coated to prevent any kind of damage to the electronic parts. I've gifted this one to my cousin and he loved it to the core.